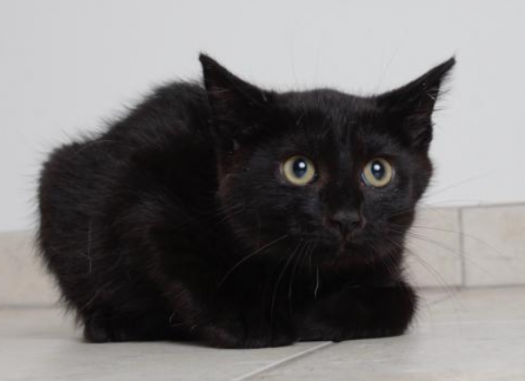 Shell is an adorable little black bundle of fur born on May 8, 2017. She was brought in as a stray with her sister Bandit who is with her in their foster home. Together they love to look out the window and watch squirrels and birds go by. When Shell arrived at Secondhand Hounds it was clear she had not have very much human interaction and was very timid and shy. She is much more comfortable and confident in her home now, but she is still a fairly independent little kitten. She is not much of a cuddler but she appreciates being pet and will give a loud purr. A more calm and quiet house would be a well suited home for Shell. She gets along with her foster family’s dog and cats. She would enjoy having another cat in the house but it is not required. An adopter should be accepting and willing to work with Shell on building up her confidence and be patient with her when she gets spooked or shy. Since she is easily frightened and timid she would do best in a family with older children. Shell is a spunky little girl that likes her independence but loves to play and explore her foster family’s house. Shell’s sister Bandit is also available for for adoption and love to play with each other. Shell is still skittish around new people and places and having her sister with her may make the transition easier, but she could also do well as an only cat. Her adoption fee is set at $200 and she can be found on the Secondhand Hounds website under the adopt tab in the cats available for adoption.